Your work makes an impact. Your resume should too. Are you the DIY type when it comes to resume writing? Learn secrets from professional resume writers and avoid critical mistakes! 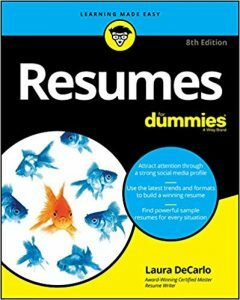 Jennifer contributed to the all new, updated Resumes for Dummies, 8th Edition (John Wiley & Sons, 2019) by Career Directors International founder, Laura DeCarlo, in addition to the 7th edition (published in 2015). Learn strategies for handling common resume writing dilemmas, including time gaps and career changes. Get inspired by more than 40 samples from top professional resume writers. See the latest design trends and learn resume writing best practices. Feeling intimidated when it comes to the modern day job search — dealing with applicant tracking systems, how to use social media effectively, or how to manage online privacy and security? Take the fear out of getting started and pick up your copy today! Job search communications have changed a lot in recent years, leaving many job seekers confused. How and when do you effectively incorporate e-notes, cover letters, recruiter letters, and networking letters into your search strategy? Jennifer’s work appears in Modernize Your Job Search Letters: Get Noticed…Get Hired and Gallery of Best Cover Letters, 4th Edition. Find strategies and samples from Jennifer and other professional resume writers to help take you from the ho-hum (“Enclosed is my resume…”) to the attention-grabbing. Interviewing well but not getting the job? It could be your references. In this competitive job market, even a mediocre reference could be enough to sink your chances. Something as simple as tone of voice or a less than enthusiastic response to a question could be enough to plant a seed of doubt with potential employers. Yet as important as this stage of applicant screening is, it’s one that many job seekers leave to chance. Want to know what your references are really saying about you? Our partner Allison & Taylor has been providing reliable reference check services for professional and executive-level candidates for more than 30 years. Make smarter choices about your references and avoid unforeseen pitfalls. LinkUp includes only postings pulled directly from company websites, eliminating the need for job seekers to sift through the duplicate listings and old postings that plague some of the better known job boards. 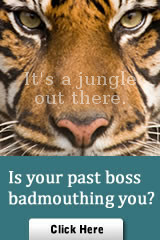 Job-Hunt.org always contains a wealth of trustworthy and up-to-date information on all things job search. My Next Move is a user-friendly site that guides job seekers through a process of researching and identifying potential career paths based on skills and interests. If you’re a recent college grad or a career changer unsure about your direction, then this is a great place to start. Sponsored by the U.S. Department of Labor. Glassdoor gives job seekers the inside scoop on companies, salaries, and even interview questions from past and present employees. StrengthsFinder, developed by psychologist Dr. Donald Clifton and offered by the Gallup Research Organization, is a great strengths-based assessment tool for job seekers – or anyone – looking to identify and cultivate their unique combination of skills and talents. In addition to your list of strengths, you’ll receive an analysis and action planning guide to help increase work engagement. You can also purchase the StrengthsFinder book through Amazon, which comes with an access code for the assessment. A version geared specifically for students just starting out on their career journey is also available. The Occupational Information Network (O*NET) database contains standardized information on hundreds of careers, regularly updated, and provides links to many interactive assessments. In addition to My Next Move, mentioned above, job seekers can find a wealth of career exploration tools here. CareerOneStop, sponsored by the U.S. Department of Labor, provides tools for job seekers to explore careers, salary info, and training opportunities. Veterans will also find links here to help match military skills to civilian careers. Hire Heroes USA is a nonprofit organization that helps veterans overcome barriers to employment and connects them with great jobs. Are you a job seeker in your 50s or 60s? We recently provided resume and cover letter tips for an article on FlexJobs.com – this is one of the best sites around if you’re seeking telecommuting work. Have you ever been laid off or fired from a job? Annette Richmond, founder of career-intelligence.com, offers lots of other great free tools and resources on the site as well, including start-up advice for entrepreneurs and tips for recent college graduates. Do you have an entrepreneurial spirit, but feel overwhelmed by the prospect of starting your own business? FabJob Guides may be for you! Jennifer is the author of four career guides published by FabJob, Inc.: Become a Career Coach, Become a Virtual Assistant, Become a Book Publisher, and Become an Organic Farmer. Founded in 1999, FabJob is an award-winning indie publisher of print and e-books that assist people in identifying and transitioning into their dream careers. The guides are used and recommended by career counselors and university career services offices across the U.S. and Canada, and are particularly useful for would-be business owners. FabJob.com offers lots of great advice, and a diverse array of guides across many industries.